If you have owned your log home any length of time, then you have probably already had to deal with maintenance issues. If you are considering buying a log home, understanding maintenance requirements and procedures can not only help in the buying process, but also help in understanding what is involved in the periodic upkeep of the home. Some log home owners after enjoying the initial excitement of the rustic beauty, the smell of the logs and the "log home living" atmosphere are disappointed to find that with all the beauty, comes all the maintenance. However, if they understand proper maintenance procedure and protocol and maintain a practical maintenance program, they can efficiently manage the upkeep of their home without becoming overwhelmed by what may seem like a daunting task. This all hinges on proper maintenance. Proper maintenance does not mean washing the home with bleach, letting it dry, and applying a do-it-yourself retail stain, or the all too familiar "water-proofing" sealer. This approach will certainly produce disappointing results. Your log home is a large investment. Spending the time and the money to maintain it is also an investment. Most people would not go to a "big box" store and buy a can of spray paint to re-paint their car. Yet all too often, the "off the shelf" retail stains are bought and used to re-stain their log homes. This is one instance in which "you get what you pay for!" Assuming that your log home was prepared properly to receive a quality sealer, and the sealer was applied correctly, you should expect 3 to 6 years of protection. You can expect less than 3 years if a clear or lighter stain is used. A good rule of thumb is that the darker the stain, the more pigment and therefore the more protection. Lighter shades (the natural look) have the least amount of pigment and the least amount of protection. So, it comes down to a trade off. Most people like the natural look of the logs. To achieve this, either a clear or a "honey" color will have to be used leaving the least protection on the logs. Using a darker color such as a "mahogany" or "walnut," you have the most protection thereby lasting the longest, but most people don't like the darker shades. Now, the log home owner will have to decide which is more important; using a lighter shade to keep the natural look and sealing more often, or using a darker stain with more protection, but loosing the natural log look. 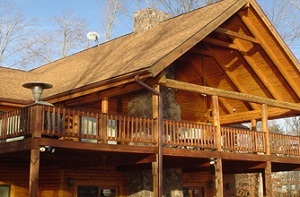 Log home restoration and maintenance is just a part of the log home experience. Understanding maintenance procedures and implementing a maintenance program can alleviate potential underlying problems such as wood rot, mildew problems, failing caulk and chinking as well as making sure your log home keeps that beautiful rustic look and feel for many years. The bottom line; Do it right the first time, have a good maintenance plan and have a knowledgeable and trustworthy contractor you can depend on. If you're looking for a professional log home restoration company in North Carolina, South Carolina or Virginia, then please call us at 252-266-9457 or complete our online request form. Thanks again! The logs have never looked that good before and the deck is unbelievable to say the least. Thank you for a great job on our house and piers. I would highly recommend Taskmasters to anyone interested in a first-class job!